Feeling festive? Spread the love this Christmas to friends you know and friends across the globe. 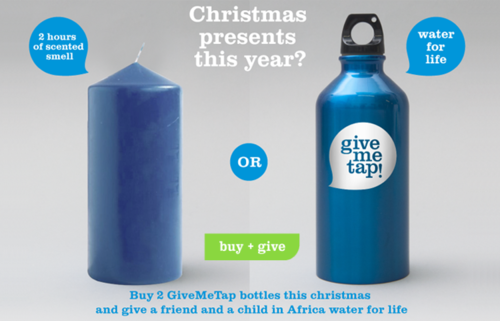 By buying just two GiveMeTap bottles this year, you will be giving a friend here at home, and a person in Africa the gift of water for life. Plus, for everyone two bottles you get FREE UK Delivery. A GiveMeTap bottle makes the perfect gift, helping to spread a movement which cares about your health, the environment and our fellow human beings. So, before you spend your hard-earned cash on gifts for friends and family this Christmas, consider this: Will it enhance their life? Will it change another life? Will it help to save the world? GiveMeTap is the voice of those desperately seeking to quench their thirst and , dodging deadly diseases as a matter of course. So don’t give to receive this year, give to give and Get GiveMeTap this Christmas. The stylish GiveMeTap re-usable bottle; for you, for a friend, for life.